Which languages does Fontaine de Mots translate into/edit? Fontaine de Mots has decided to specialise in French, Dutch, German and English, the four most commonly-used languages in Belgian businesses. Translations involving other languages can also be arranged through our extensive network. How do I know that Fontaine de Mots delivers quality work? You can read the testimonials from some of our clients, check our website in French and Dutch, watch the interviews with some of our translators or ask us to translate a few pages before you place your order with us. How do I send my documents to Fontaine de Mots? You can send your files to info@fontainedemots.be. Where possible, send us editable documents (Word, Excel, etc. ), rather than PDFs or images (.jpeg, .tiff, .png, etc.). If you would like to have your website translated, send us the Web pages in HTML format. This will save a lot of time. If your files are very large, you can send them using a free file transfer service such as WeTransfer. Don’t send us documents by post. 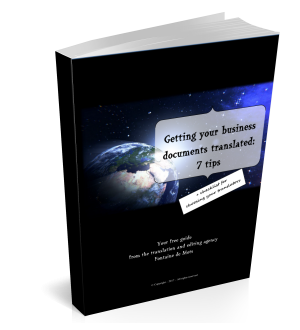 Remember to tell us the language(s) into which your documents are to be translated. We will send you a free quote, normally within 24 hours. How soon will I receive my translation/my edited text? Our professional translators are used to meeting tight deadlines. Our clients really appreciate our flexibility. However, it all depends on our schedule and the length of your document. If it is imperative you receive your translation by a specific day and time, let us know. We will do our utmost to meet that deadline. But please keep your deadlines requests reasonable. Alternatively, we will suggest a delivery date. If it doesn’t suit you, we will contact other translators to see if we can send you the text sooner. The price depends on several factors such as the language combination, the number of words, repetitions in the document, etc. Email us your files. We will get back to you very quickly with a free quote. If it’s the first time we have worked together, you will even receive a welcome discount! Does Fontaine de Mots respect the confidentiality of my texts and documents? Of course! Confidentiality is one of the golden rules in our industry. Each of our partners has committed in writing to respect the confidentiality of all the documents we send them. We translate documents from multinationals and leading companies on a daily basis. We are used to handling sensitive information (such as strategic documents, crisis-related messages and press releases subject to embargos). I am a private individual, not a company. Can I use your services? We only work for legal entities (companies, associations, organisations), not for individuals. We can however recommend translators who work for private clients. Do you have any other questions? Phone us on +32 (0)19 56 67 30. © Copyright – 2017 – All rights reserved – Fontaine de Mots SPRL-S.